Anne Zahalka's series ‘Leisureland’ continues the artist's preoccupation with the nature of the spaces we inhabit and the nature of their construction. ‘Leisureland’ maps some of the co-ordinates of modern leisure in images that occupy a vantage point between the production and consumption of downtime. Her photographs document the stuff we do usually under the label sightseeing. Leisure was once a time for relaxation and an essentially private time. In the late 20th and early 21st centuries, leisure became an industry and a very public pastime. Zahalka's series captures the range of leisure activities and their locations: climbing the Sydney Harbour Bridge, the Open Air Cinema, observing philosopher Jacques Derrida in conversation with then Sydney University academic Terry Smith at the Sydney Town Hall, and the Royal Easter Show amongst many other city and regional activities and events. 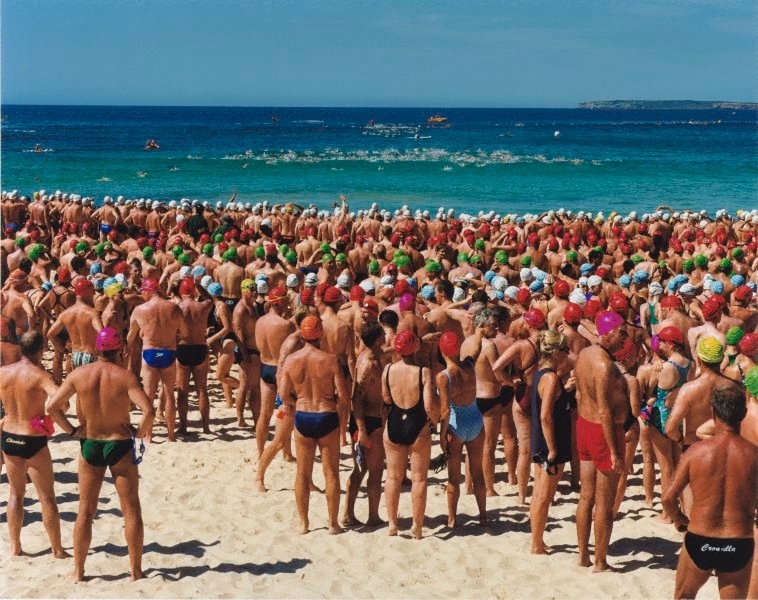 The Cole classic at Bondi Beach is an activity involving hundreds of people, it is neither relaxing nor private, and encapsulates the artist's concerns as evidenced in the series overall. 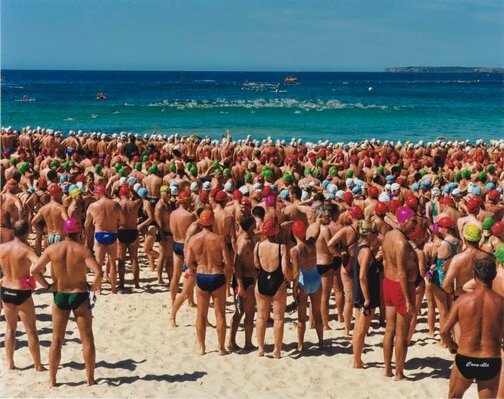 The image presents a hyperreal beach environment with crowds of people in swimming costume, distinguished by the colour of their bathing caps. The rows of people which continue into the middle distance give way to bands of brightly coloured sea and further lines of swimmers before the horizon and the sky. The harshness of the colours and the ant-like mass of people seem both supremely Australian as well as hot and claustrophobic. Zahalka's earlier work in the Gallery's collection gives similar instances of the constructed and frequently constricted nature of portraiture, beach culture, and gesture. Bronwyn Clark-Coolee, Photography: Art Gallery of New South Wales Collection , 'Not 'simply' anything', pg.266-287, Sydney, 2007, 285 (colour illus.). Jill Sykes, Look , 'Heightening reality', pg.19-20, Sydney, Mar 2007, 19 (colour illus.). Art Gallery of New South Wales Annual Report 2002 , 'Year in review', pg. 8-25, Sydney, 2002, 14 (colour illus.). Photographic Australis , Sydney, 2002, cover (colour illus. ).